After the previous day’s wet and cold weather we were met by a mild and misty morning. The day’s route will cover less distance and less height in total than the previous day however we would climb almost 35km to an altitude of 2,762m! After breakfast I got my bags down to the support vans, grabbed my bike and set off with Tony Lowe, Graham Balshaw and his son Gareth. Most of the guys had left by now, it was only my fellow Team Chronomaster teammates that were still at the hotel. The goal for the day, as it was every day, was to get as far up the road as possible before they caught me. From the hotel it was downhill for about 3 kilometres before we turned left and on our way to Val-d’Isère. Our first challenge came about 5 kilomtres from the hotel when our garmins said to turn right in the town of Montvalezan. We turned right but it turned out to be the wrong right and we had to backtrack. After a few stops to check the direction and ask questions of locals (who could not speak English, nor could we speak French) we got the correct turn and were on our way again. Gareth was suffering though. A few months earlier Gareth was flying but picked up a knee injury which started playing up. With Graham sticking by Gareth, Tony and I pushed off into the distance. On a short descent into Le Mirior I heard a strange noise behing me. Thinking nothing of it I pressed on but as I crossed a small bridge and took a sharp turn right I noticed Tony was not behind me. Fearing the worst (strange noise?) I turned around and rode up the hill again. Luckily I did not have to go too far before I found Tony beside the road… fixing a puncture. Light tryres and all that… he hot a rock which cut his tyre and innertube. While helping him fix the puncture Graham and Gareth came flying past and although they wanted to stop we told them to crack on, we’ll catch them. With Tony’s tyre fixed we set off again, now in persuit of the Balshaws and me having the fear of death in me that my teammates will catch us before we start our first climb. 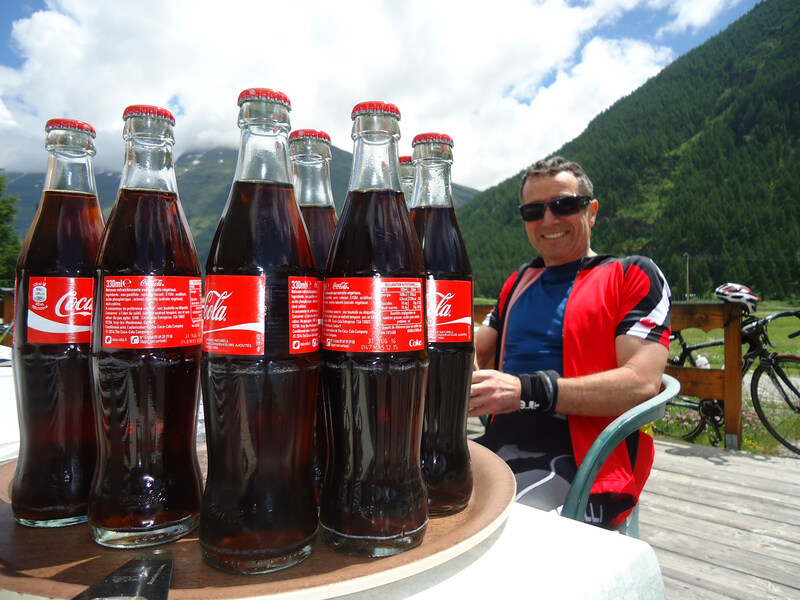 Luckily we did not lose too much time and soon caught up with most of the Alps riders as we started the ascent to Val-d’Isère. Setteling into a nice tempo ride, well trying to stick on Tony’s wheel, we passed a number of the Alps guys. Eventually, as we rode up the Isère valley, I saw the a few of our riders up the road just as they entered a tunnel. In the weirdest way possible one of the riders, Steve Harker, did a 90˚ left turn and went down! It turned out he still had his sunglasses on when he hit the dark tunnel and could not see anything. While I was gazing at the dam and valley, Tony was feeling good and started pressing on a bit. My legs were not too happy with me and I just sat at my own pace, with the Balshaws and Steve Harker now in tow. Tony waited for us in Val-d’Isère (a French village I definately want to visit when it is snowy) and then we started the gradual ascent up the valley towards Col de l’Iseran, the highest paved pass in the Alps. Gareth’s knee started playing up again so Tony, Steve and I left them in the valley. However, not too long after Tony left me and Steve behind and then I left Steve behind. One thing I’ve learn’t during this trip was that when you hit the big climbs you stick to your own pace. You cannot ride slower for someone, it just makes it harder for you. Additionally, I could hardly talk. I felt fine just climbing but as soon as I started talking I was out of breath! Eventually I passed Ste Pritchard, one of the organisers of the trip. All I could do was grunt a sort of “hello” and pressed on. I knew Tony was ahead of me and every few corners I could see someone else up the road. I was gaining on both Tony and this other rider slowely, but I was gaining which is all that mattered. 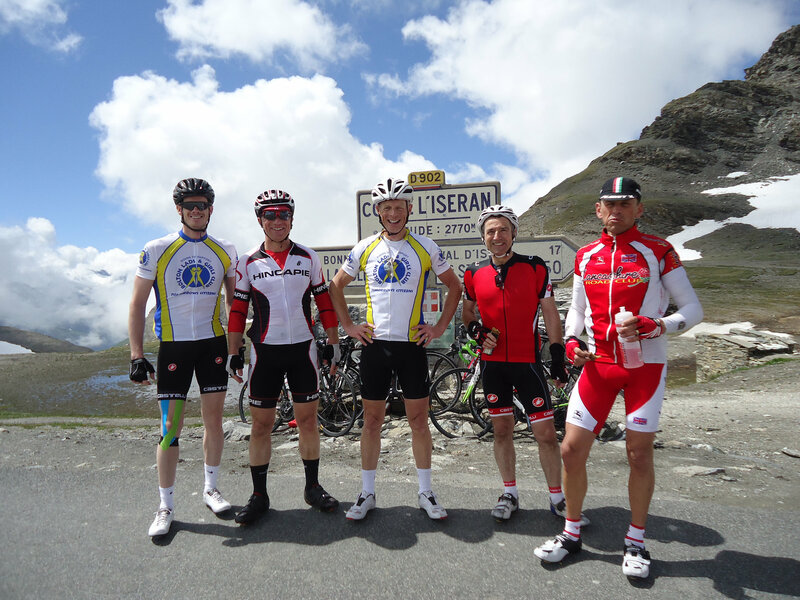 When I got to the top of Col de l’Iseran I got the full story. The other rider was also one of our group, Pete Leather. Pete set off early in the morning and Tony managed to pass him close to the summit however Pete was not having any of that and repassed Tony and went on to beat him to the top. After stopping for the customary photos and top-up water bottles we set off down the mountain in search of our lunch stop. By now the group has grown again with the Balshaws, Ste Pritchard and Pete Leather joining us. Once we hit the valley floor we pressed on, determined to get to the lunch stop before getting caught. Eventually we reached Bessans and after searching for a place we found something right on the road. It seemed like a good idea at the time however the Frenchman who owned the place was the most miserable man I’ve met in my life. And the lunch menu, omelette and salad. We sat down for our ‘amazing’ luch and was joined by other riders from our group. Eventually my teammates also rocked up and convinced me to ride with them, afterall, it’s mostly flat all the way to the hotel. Just the small matter of Col du Télégraphe and a headwind to negotiate. After lunch we set off down the valley and when we reached Sollières l’Endroit we took a right for a grippy, lumpy ride to Modane. Of course we could have stuck to the valley road but who wants to do that when you’re tired and batteling into the wind? After stopping in Modane me and Ste Feeney (teammate) sat on the front for most of the way to Saint-Michel-de-Maurienne where we turned left and onto the Col Du Télégraphe. By this time I was suffering badly. My legs did not like the 9% gradient that greeted us on the way up and I dropped back. It was only about 10km to the top but it was a hard 10km. I passed on of my other teammates, John Bamford, about a third up. I’ll be honest, I felt cery chuffed about this. John is about half the size of me so for me to be able to pass him is an achievement. That said, he also spent the day with the team and I can only imagine at what speeds they were climbing to Val-d’Isère and Col de l’Iseran. Sadly vicotry was not mine! With about 3 kilometres to go John came past me again and I was just not able to follow his wheel. Once at the top and having taken a few photos we set off down the descent into Valloire, our stopping place for the evening. It was a great day on the bike. It was hard but I fell in love with the Alps. And Val-d’Isère, I’ll see you again when you are snowy and white. 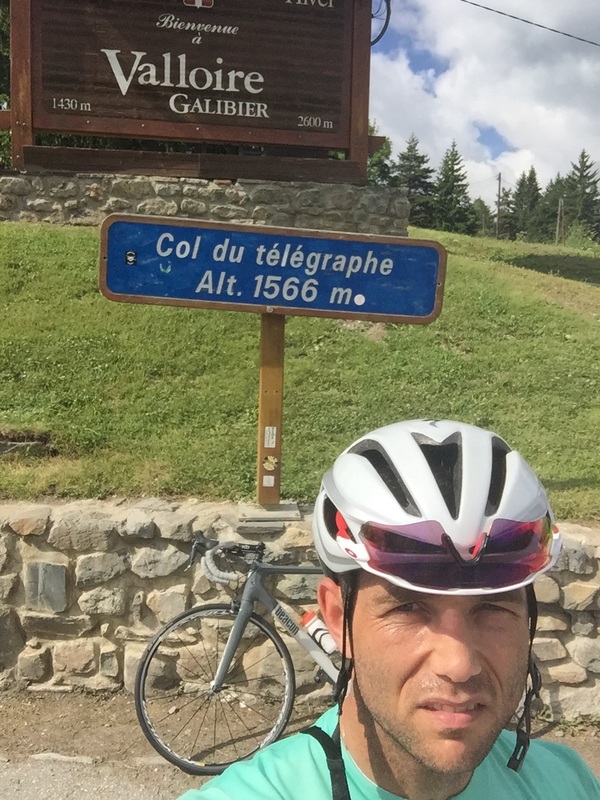 This entry was posted in Challenge Reports and tagged BLGC, Bolton Lads And Girls Club, Bourg Saint Maurice, Col de l'Iseran, Col Du Télégraphe, Modane, Sollières l'Endroit, Tignes Dam, Val-d'Isère, Valloire. Bookmark the permalink.